PIC-CONTROL provide firmware PIC programming service for microchip range of microcontrollers. Microchip range of microcontrollers provides a wide range of microcontrollers to choose from and cater for any applications that you will need for your product. Programming firmware is unlike any higher software development work that programmers do on a Window/Mac/Linux computer operating system. Firmware programming requires a hardware knowledge of the individual microcontroller that you are programming. Every microcontroller is unique, and it is this that may make firmware programming a time-consuming work. Why choose PIC Programming over Modern Arduino Programming? Modern firmware programming uses Arduino platform changes the microcontroller development trend but however has its limitation due to the defined structure the platform is offering. For simple embedded product development or product prototyping, Arduino provides a faster turn around time, which reduces engineering cost. For precision or real time sensitive application, microchip PIC programming or Atmel AVR programming is still the best method of firmware programming development. Firmware programming requires a strong understanding of the microcontroller internal chip architecture. Firmware programming can be a very tedious and frustrating experience, especially for beginners. There is a methodology to follow in order to debug the firmware and its operation. Without proper engineering practice, debugging firmware can be challenging. It requires a lot of patients to do firmware programming. 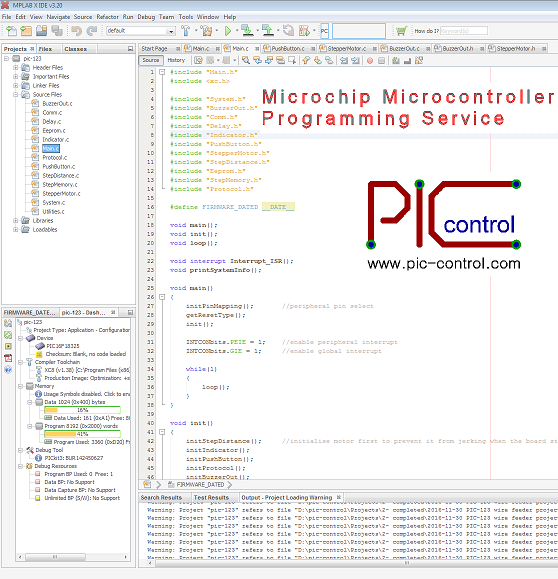 PIC-CONTROL has a great experience in microchip range of microcontrollers and is about to provide PIC programming service for your electronic controller hardware. Send in your enquiry to PIC-CONTROL today, let us assist your firm programming development work. Recommended range of 8 bits microcontrollers. Recommended range of 16 bits microcontrollers. Contact PIC-CONTROL for a chip programming service. Microchip microcontroller firmware recovery service. Replication of source code for your existing Microchip PIC microcontroller IC chip. Design and development work using microchip microcontroller products. PIC-CONTROL also provides Arduino Programming Service and Embedded System Design. Check out the respective pages for further information. for your Microchip PIC Programming Solution.